Mass Teddy had lost his wife Mabel. Their son Leslie had changed his mind about going to America and come back to help look after Southfield. He would write to his brother Maurice in New York, telling him that their father Mass Teddy – now in his 60’s – was selling and gambling away a lot of land. Leslie would eventually fight his father over this. Cecil was now back at Southfield, maybe wondering how he could become an American citizen. Mabel’s young granddaughter, Cissy Hodgson was to be taken on by her grandmother’s sister, Dorcas Speid, a teacher at Mayfield School, who lived not far away at a property named Waldnasdor. 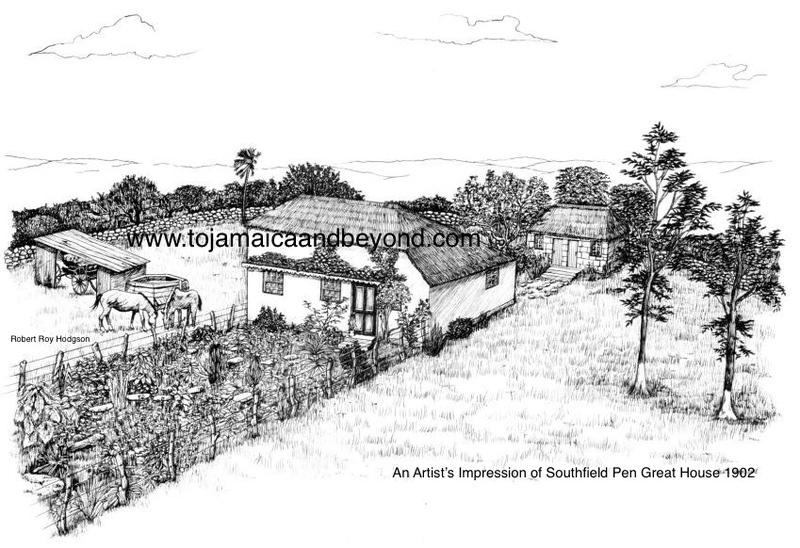 Family members that didn’t live at Southfield Pen would visit the home regularly. Linton and his youngest sister, Hortense would eventually become American citizen’s. On Tuesday the 8th May 1945, after six years of war, Germany finally signed an unconditional surrender. War in Europe was over. The British celebrated in the streets. It was VE Day – Victory in Europe. England had been bombed out and would need rebuilding. There would be plenty of work, much labour would now be needed…. After working as a Farmer, Vin was still determined to become an American citizen. Just eight days after the war ended, Vin was admitted into the US Naval Training Center at Chicago, Illinois. By joining the American Navy, Vin would get the chance to become an American Citizen and be near his father. Vin’s Uncle, Cecil Hodgson did not follow the same route, he remained in Jamaica. Intriguing and fascinating history.The pictures, details and names are familiar.My husband is related to Mabel and often converses with a descendant who resides in Mississauga , Ontario , Canada. Your blog is informative and heartwarming. Thank you for inspiring others to reflect and hopefully record our stories for posterity. Thank you for reading our family story Eulah, glad you are enjoying it. Does your husband come from the Southfield area. I do agree that people should record their history, it is so important to everyone, especially for those families whose ancestors have emigrated to other countries.